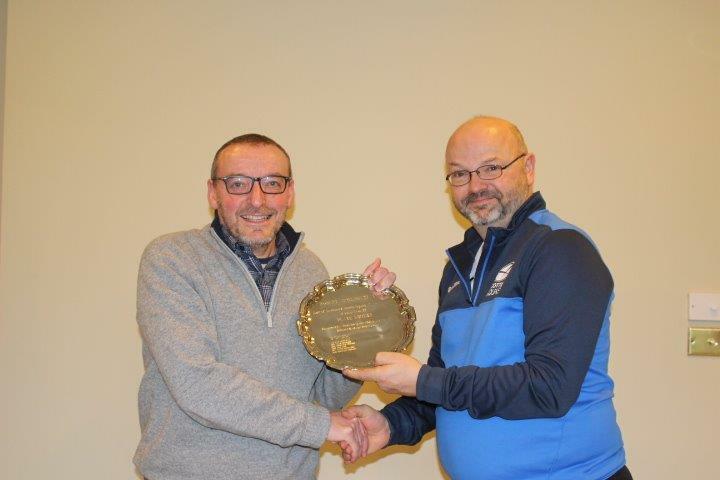 The East of Scotland Regional Masters competition was held at the Edinburgh Sports Club (ESC) on 19/20 January 2019. There was a total of 78 competitors who took part in two Ladies’ competitions and seven Mens’ competitions. Mark Adderley and Gareth Brown and the East Committee managed a very well organised tournament. They all worked hard to make all competitors welcome and ESC provided a very good catering service throughout the tournament. At the prize giving the competitors thanked the organisers for all their hard work in managing the tournament. 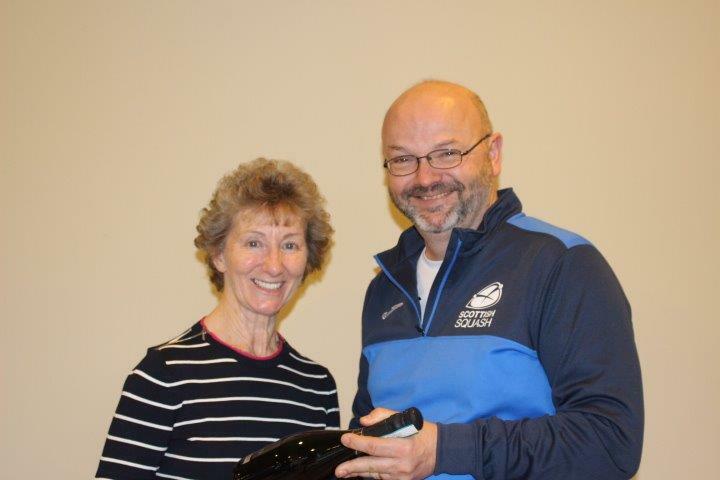 Jim Hay and fellow referees supported the committee and the players by providing refereeing services throughout the tournament. There were four competitors and the competition was played as a round robin. Following a late withdrawal due to injury, the event sadly only had 3 players. 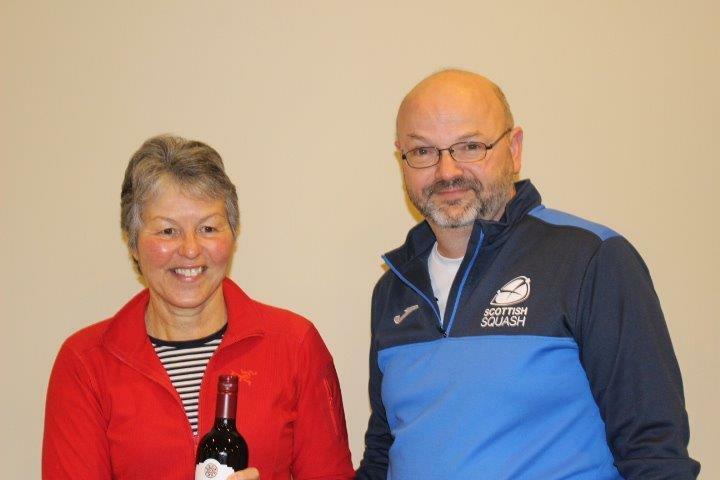 Heather Spens from Edinburgh was the favourite but Julia Horsburgh from Perth put up quite a good fight in their match. Heather was 2/0 up but Julia manage to get back to 2/2 only for Heather`s superior touch to come through in a tight fifth game and she won 3/2. 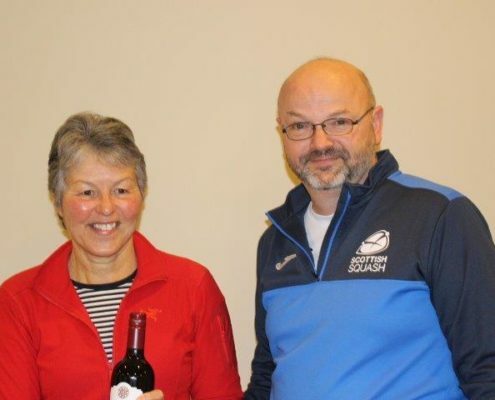 The next match saw Julia play Bernie Beattie from Dunblane, well known for her skilful dropshots and volleys. Julia managed to come through 3/0. Lastly Bernie played Heather, warming into the match as it went along, but Heather came through 3/1. Final result was 1st Heather, 2nd Julia and 3rd Bernie – all the matches were played in a well-spirited, competitive, and friendly nature. Eunice Bond and Pauline Douglas were the top seeds in this event and started with confident wins against Norma Mitchell and Maureen Carroll respectively. Christina Graham was Eunice`s next opponent and this proved to be a close match from the start with Christina winning the first game 18-16. Both produced quality serving and good length but Eunice`s winning boasts proved to be the difference and emerged the victor 3-2. Christina`s second match closely followed with another five game match against Maureen whose excellent serving and accurate straight drops proved to be a winning combination. Pauline finished her day with another 3-0 victory against Norma who continues to improve and shows lovely touches with the racket. Sunday started with Eunice and Maureen playing nip and tuck in their first game with Eunice winning 15/13. Thereafter Eunice kept the pressure on Maureen and won the next two games 15/8 and 15/12. Pauline then played Christina and displayed a lovely variety of strokes and had her covering all parts of the court. In the end a ‘masterclass’ by Pauline and another 3/0 win! The final between Eunice and Pauline was eagerly anticipated and started with some great serving from both girls but Pauline`s deftness around the court and wonderful variety of shot making and selection proved to be a real winner and although Eunice stuck to her task and managed to get into the rallies the more Pauline refused to let up with very few errors and won in the match 15/5, 15/4, 15/10. Final result was 1st Pauline, 2nd Eunice, 3rd Maureen. 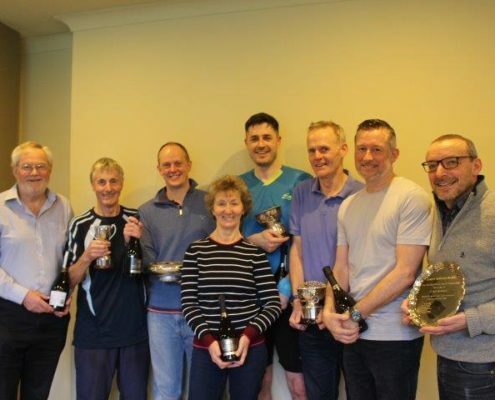 Unfortunately there were only two entries for the O35 event and six entries for the O40 event and a combined O35/O40 event was held with eight competitors and a straight knockout draw. In the first round (quarter finals), no.1 seed Andy MacBean beat Jon-Paul Dinnin 3-0.
in the 3rd and managed to see out a tough 3-0 win. up the final between the top 2 seeds. In the final, Grant got ahead in the first game, however Andy eventually took it 11- 7.
strong and came through to win 3-0. The plate was won by Scott Hay, beating Billy Scott 12-10 in an epic final! for hosting and to everyone who marked matches over the weekend. There were eight entries allowing a straight eight player knock out draw. 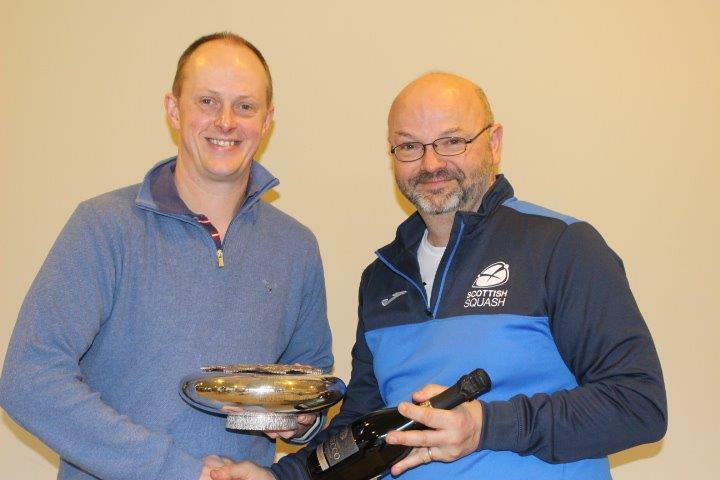 In a strong competition the winner was yet again Simon Boughton (No1 seed) and runner up Douglas Emery (No 3 Seed). In the plate Jaume Berge (No 8 seed) was the winner over Craig Doel (No 5 seed who played in the 050s as well). On Saturday morning, all the matches went as per seeding. Simon played Jaume who was full of energy and was hitting the ball well. Unfortunately, Simon was always in control and apart from a few errors in the second game won comfortably. Adrian Richmond (No 4 seed) had a harder match against Craig who preferred to be very attack focus and go for his shots. Adrian was playing well in the first two games before Craig hit a run of shots to take the third. Adrian wasn’t going to let Craig get back into the game and took the fourth and the match. Douglas played Adam Clayton (No 6 Seed), who beat him in the last tournament. The first game was nip and tuck with Adam getting a first chance of game ball. However, he missed the opportunity – a straight volley into the tin when it just need to be up and lost the game 14/12. From then on Douglas was always in control and won the next two games relatively comfortable and the match 3/1. Peter Buchan (No 2 Seed) was in good form and was always in control as he comfortably beat an out of sorts Ian Morrison (No 7 Seed) 3-0. In Saturday afternoon, the plate competition commenced. In probably the best match of the 045s Jaume took on Adam, their first match against each other. It was a marathon thriller that went down to the wire. Adam was on fire in the first game and took it relatively easily 11/6. The second game was nip and tuck with Jaume taking it at the end. He then continued the good work with a comfortable third game 11/7. Adam still was in it and he never gave up and took it into the final game. The final game was a nervous affair where no-one could hit that winning shot. The game kept going on, with plenty of handouts although the eventual winner was Jaume, 15/13. In the other plate semi-final Craig was out of the blocks early. He won the first two games relatively quickly and easily (11/3, 11/4). However, Ian woke up in the third and started moving Craig around much too his discomfort. Although Ian took the third game 12/10, he hurt himself with the extra effort and had to retire. 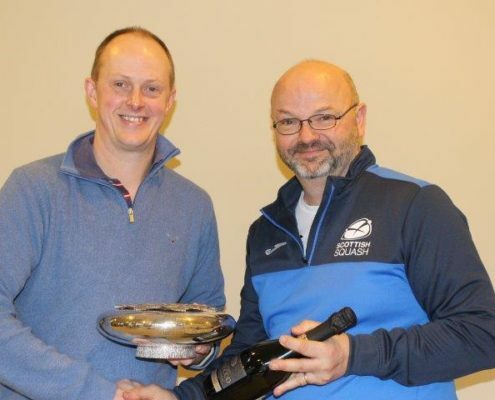 The final of the plate occurred on Sunday afternoon and was a close-run affair by two evenly matched players. Jaume was the much more dynamic player against Craig who had a plan of winning the point quickly. The match was very fast and furious with points moving from one person to the other (hand-in and then hand-out). The speed of the points seemed to suit Jaume better with only a wobble in the second game and he won the match 3/1. Back to the main competition and Saturday afternoon – the first semi saw an in-form Adrian take on the ESC Coach Simon. However, Simon was in no mood to give Adrian a chance. With his family watching on, Simon just played his usual high quality and control game with minimal errors. Adrian tried a lot of different things but could not cope with Simon’s quality and lost quickly and comfortably 3/0. The second semi was a much more closely fought encounter. Peter was playing Douglas who he had never lost to before, so was favourite for this. Unfortunately for him that doesn’t really matter for anything on a court if you are not playing better than your opponent. The first four games saw Peter get an early lead of either 7/3 or 7/2 but could not pull away in any of the games. Douglas played a lot of shots straighter (up and down the wall) and more determined game (ran everything down) which kept asking questions of Peter – who failed to keep up his usual low error count. So, after four games it was 2/2. The fifth game saw Douglas take charge and go straight into a 5/0 lead. He then played two excellent winning boasts and Peter was not good enough to come back and lost 11/7. Douglas very much deserved the win. In the M045 Final, the two best competitors over the weekend made it. Also, Douglas had the opportunity to try and beat Simon for the first time too. However, Simon playing on his home courts with a good support around him was not going to make it easy for Douglas. Douglas worked for everything but Simon’s class showed throughout each rally and punished Douglas for every poor shot that he hit. From this Douglas could not get into any of the games and Simon won comfortably 3-0. 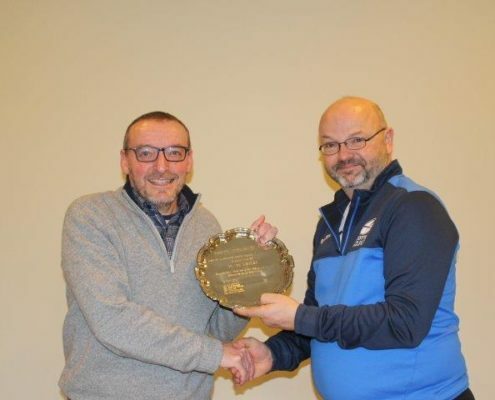 In the corresponding event a year earlier, the draw was full with 16 players, but the number in 2019 was lower at only 9 entrants. Despite the drop in numbers, it still looked like it would be an eventful and challenging weekend, with the 3 different winners of MO50 events played so far this season all included and a cluster of other players well placed in the rankings in recent seasons. 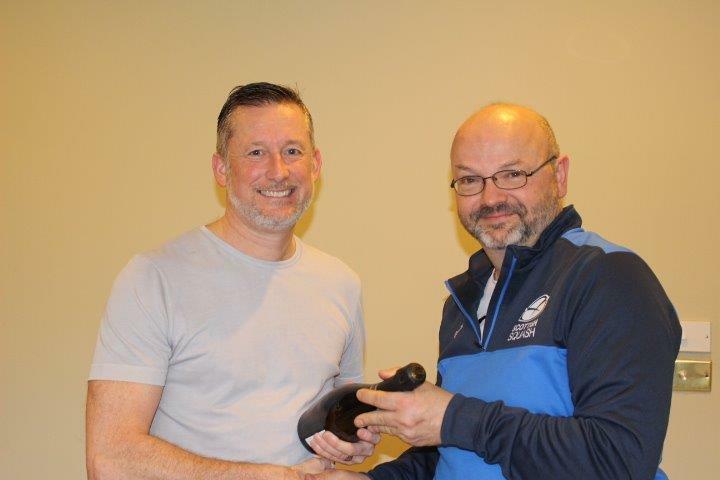 There was a single match played on Saturday morning, in which Donald Durrand got the better of Adam Hill, coming from a game behind to win 3/1. 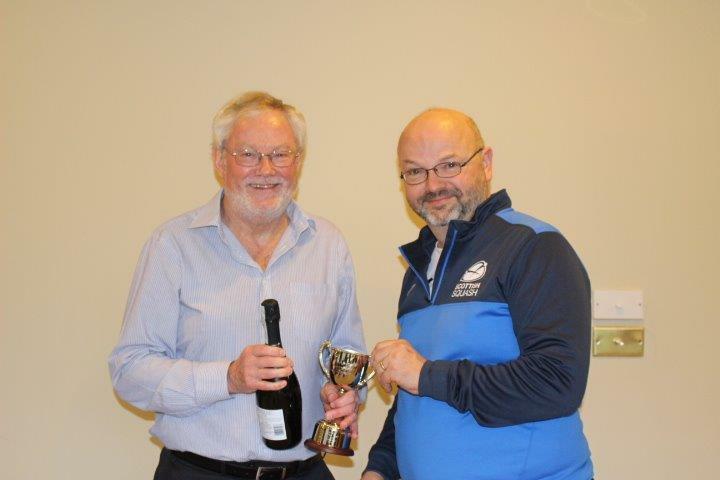 Mike Ramsay v Donald Durrand – it was plain sailing for top seed Mike in this match as Donald paid the price for playing in two events and having played two matches prior to this one. 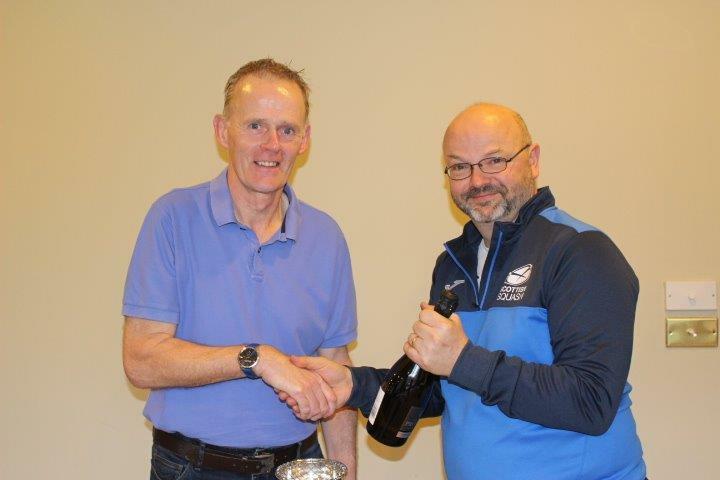 Craig Doel v Colin McMullan – the outcome of this tie was difficult to call beforehand and it was Colin who made the better start, winning the first game. The second and third games proved critical in determining the final outcome, Craig winning both narrowly (12/10, 11/9) to move from a game down to one up. He was then able to finish the job in the fourth. David Lindsay v Paul Jenkins – second seed Paul didn’t have things all his own way in this match – David had game balls in the second game – but overall Paul was in control and won 3-0 to progress to the semi-finals. 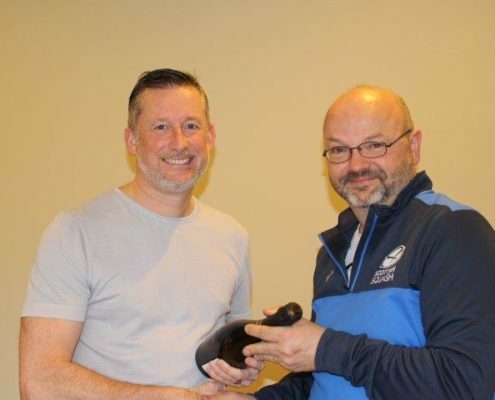 Brian Robertson v Craig Mitchell – Brian came from behind in the first game to sneak it 11/9 and from that point on managed to keep his nose in front to win in straight games. 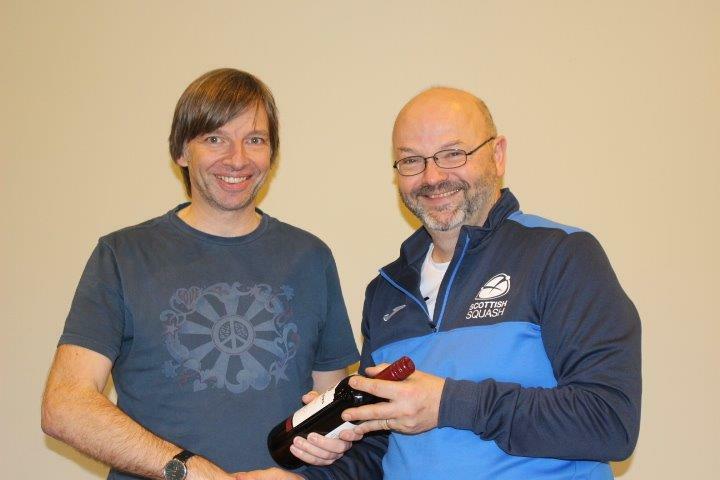 Craig’s weekend ended better than it started as he won the plate competition with a straight games win in the final against David Lindsay. Sunday brought semi-final matches between Mike and Craig Doel and Paul and Brian. 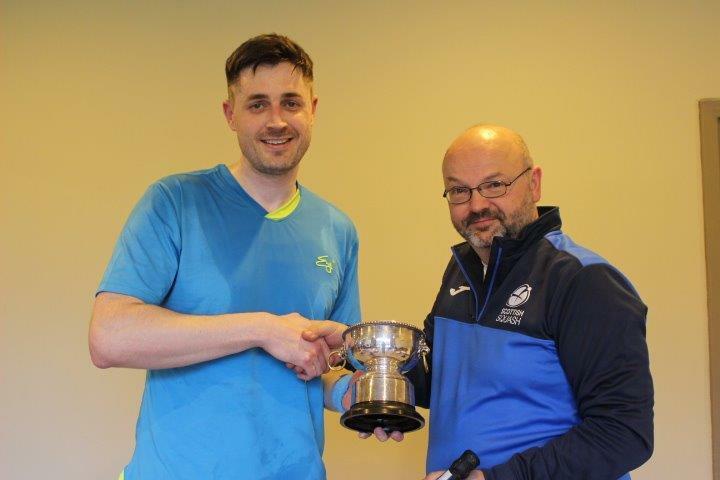 Despite Mike having a problem with a calf muscle during the match, resulting in a few more shots hitting the tin than we are accustomed to, he was able to see off Craig’s challenge to win another match in straight games and progress to the final. In the other match, Brian was unable to convert a 10/7 lead in the first game, Paul doing very well to retrieve the situation to win that game 13/11. Brian won the second game by a comfortable margin, but Paul won the third even more comfortably and he carried that form into the fourth to seal the match 3/1. So Sunday afternoon’s final was between the top two seeds and former teammates from many years ago. 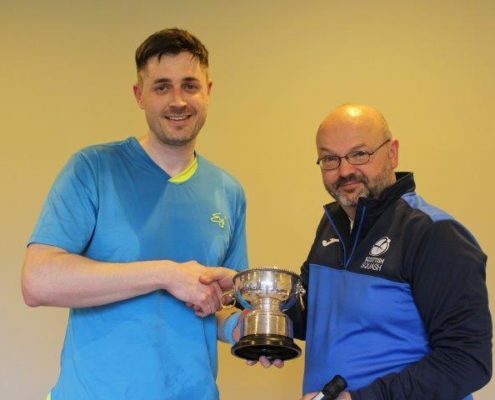 Games were keenly contested, but it was Mike who managed to convert points into games, winning out 11/9, 11/6, 12/10 for his second Scottish Regional Masters title of the season. With one late call off there were eight players lined up for this age group. The Saturday matches were to see the one and two seeds, Russell Hunter and Ronnie Carter have comfortable wins over Lance Marshall and Eric Duguid. 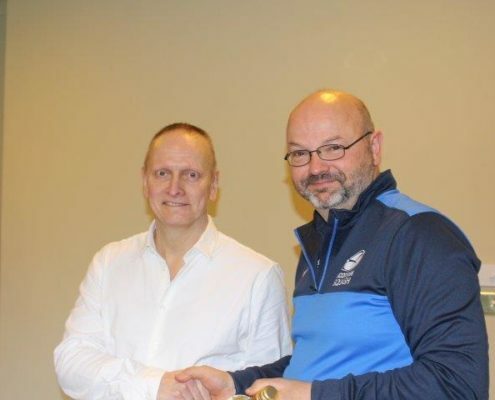 In the other two matches Keith Gristwood had a excellent 3/2 win over the number 4 seed, Donald Durrand, taking the fifth 15/13 and with local player Trevor Mitchell just having the edge in his match with fourth seed David Goldring, winning 3/1 the semi final line up was complete. In the first semi Trevor Mitchell was looking to cause a upset in his match with Ronnie Carter, but Trevor was struggling to read Ronnie’s unorthodox squash and apart from some success in the third had to settle for a 0/3 defeat. In the other semi Russell Hunter and Keith Gristwood shared the first two games before Russell upped the tempo and took the match 3/1. And so to the final, Russell and Ronnie in the past usually have close matches and this was to be no different, Ronnie powered his way to a 2/0 lead with his usual boasting tactic in the third Russell took complete control winning the game 11/2, the fourth was to turn out to be a pivotal game as Ronnie failed to convert a match point and Russell took full advantage taking the game 12/10, the fifth saw the score line tight until Ronnie got to 9/8, but two winners and an error later and the match went to Russell. 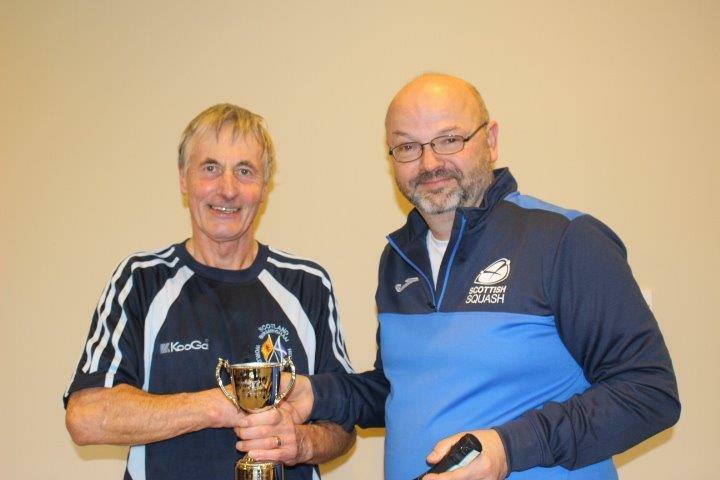 Well done to Russell who is in a rich vein of form right now adding the East title to the West title he won in December. 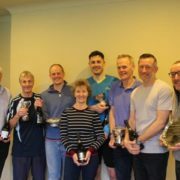 In the plate matches it was David Goldring and Donald Durrand who progressed to the final, with David proving too strong on the day winning 3/0. There were 10 competitors and the competition was played as a knock out. There were only two first round ties. 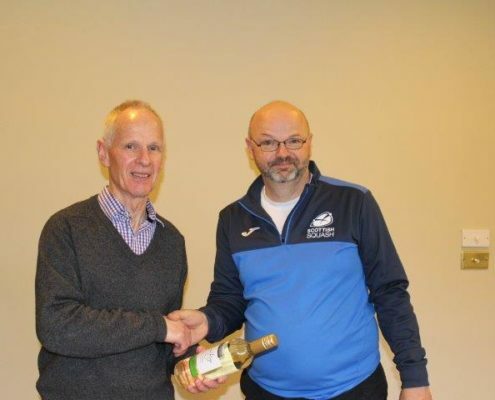 William Jappy cruised passed Lance Marshall with his distinctive high lobbing game, winning 3/0 and Kenneth MacMillan proved too strong for Duncan Selkirk and went on to win 3/0. Although William played really well with some awesome and unpredictable shots Robin’s consistency proved too much for William and Robin went on to win 3/0. 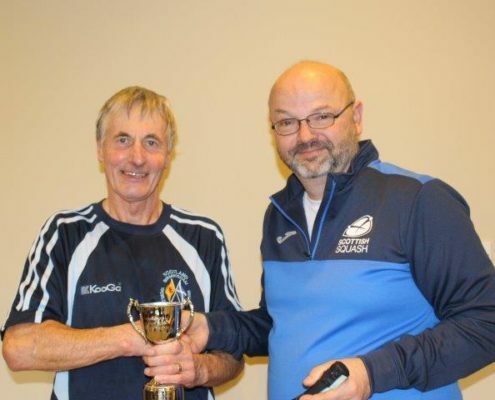 This was Dave’s first match in this age group and Ken played his first competitive match for over a year after recovering from a serious leg injury. The first game was very competitive and Ken won the game 15/13. Dave fought back and played an excellent game, hitting the ball tight to the back of the court and won the next three games against a tiring Ken. Dave won 3/1 and progressed to the semi final. A pretty tight game but Keith proved to be too strong for Kenneth. Keith was able to pick up most of Kenneth’s shots and force him to the back then play a series of winning drop shots. Keith went on to 3/0. John began the first two games very strongly and quickly went into a 2/0 lead. In the third game Bryan found his touch and pushed John quite hard, but John managed to win the third game and the match 3/0. This was another close encounter between these two. It was a scrappy match with lots of errors on both sides. Keith went ahead easily 2/0, but John came back to win the third game and had game point in the fourth game but was unable to win that game and Keith won the match 3/1. Robin won the first game but Dave fought back and Robin to make a number of errors and Dave levelled the match at 1/1. Robin stepped up the pace during the third and fourth games and eventually won the match 3/1. The first game was pretty even with both players feeling their way, but Robin came out winning this game. Robin continued his good form in the second and third games and Robin won the final 3/0. 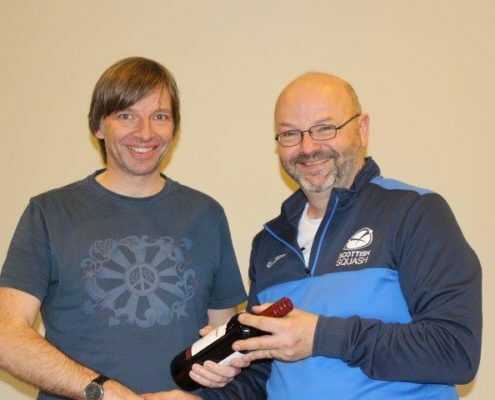 Bryan Jackson beat Lance Marshall 3/0 and met Ken Maxwell in the final of the Plate. Bryan started strongly and won the first game but Ken showed his experience and class and he won the next three games and the Plate final 3/1. There were 14 competitors and the competition was played as a knock out. Ernie Cowell, the top seed withdrew on Friday and the draw was rescheduled. There were six first round ties which were played early on Saturday morning and the top two seeds received byes. Emilio Fazzi, Dave Sturman, Walter McAllister and Warren Cameron had comfortable 3/0 wins against Colin Davidson, Phil Leek, Matthew Crawford and Duncan Selkirk. The other two ties were more competitive. 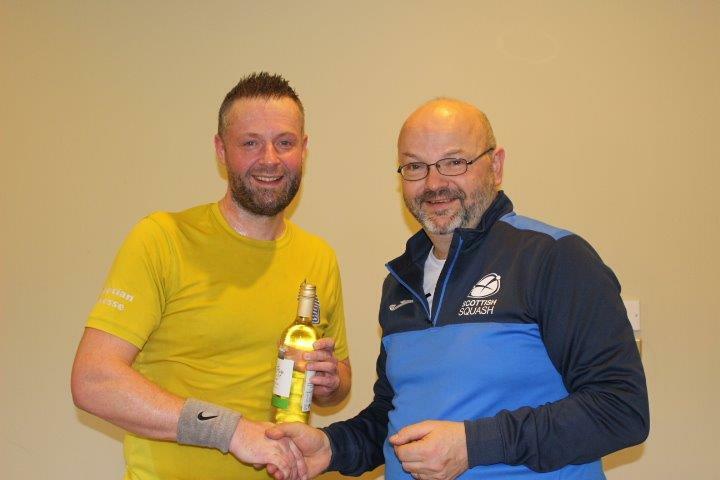 Brian Duffy, a newcomer to the Masters circuit this season, beating Jim Webster in a 4 game thriller with Brian winning the third and fourth games 17/15, 18/16. 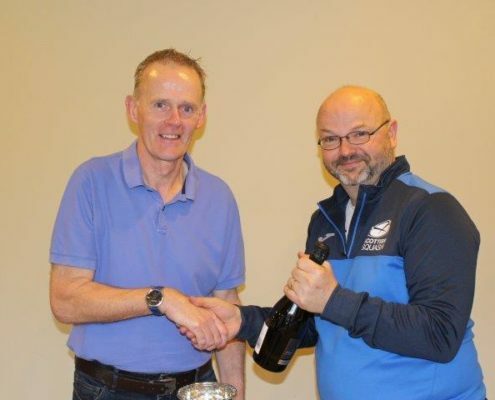 In the remaining tie Eric Donohoe, who has recently joined the O65 age group, beat Paul McDonald, a visitor from Cheshire, by 3/1 in a closely contested match. 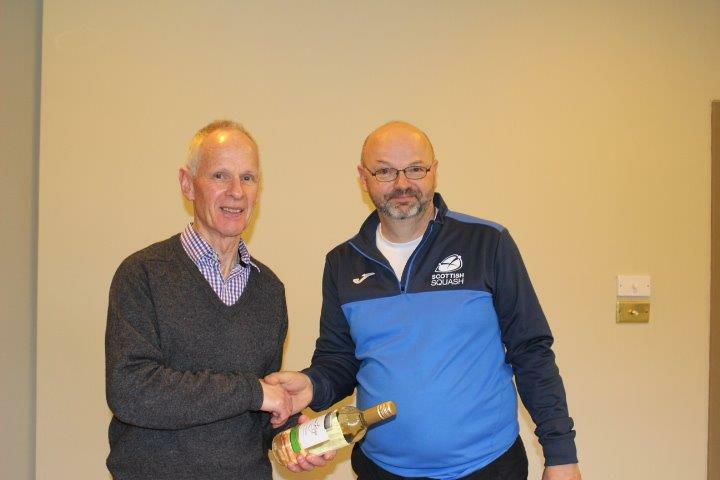 Jim Dougal and Ian Ross, the top two seeds, joined the other first round winners in the quarter finals. Jim Dougal, Dave Sturman and Ian Ross safely progressed to the semi finals with 3/0 wins against Brian Duffy, Walter McAllister and Warren Cameron. In the other tie Eric Donohoe started very fast and won the first game but Emilio fought back and won the next game. The next two games were shared to level the match 2/2. In the final game it was ‘nip and tuck’ all the way and at 12/12 either player could have won, but it was Emilio, who held his nerve and won the last three points and the game 15/12 and the match 3/2. This ensured that the top four seeds progressed to the semi final. The semi finals were played on Sunday morning. First up was Jim v Emilio and then Dave v Ian. Jim started well and playing his drops and boasts he took an early lead against Emilio. Emilio kept in touch with some crisp winners but Jim closed the game out 15/12. The second game was a repeat of the first and although again very close Jim won the second 15/12 and took a 2/0 lead. Jim took control of the match and despite resistance from Emilio won the third game 15/10 and the match 3/0. In the second semi final Dave started strongly and built a good lead with winning drives and boasts. Ian got back into the game by hitting a better length and moving Dave around the court but Dave closed the game out 15/12. Ian fought back in the second game and led 14/10 but Dave then levelled at 14 all before Ian held his nerve and won the game 16/14 and levelled the match at 1/1. 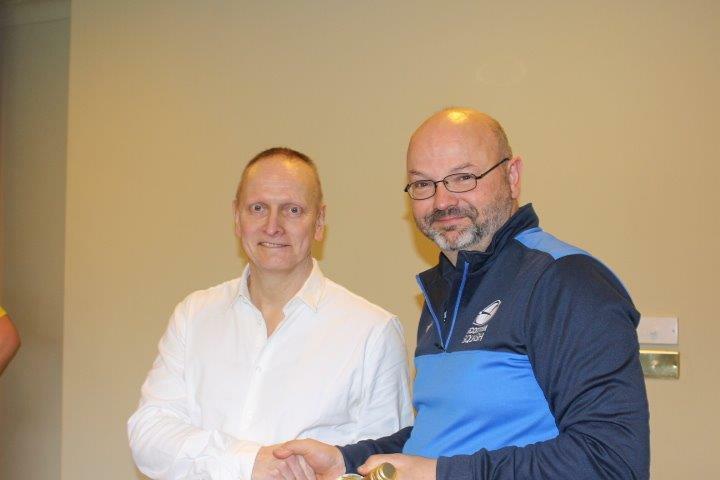 The next two games were closely contested but Ian had the upper hand and won both games 15/11 and the match 3/1 and progressed to the final. In the final Jim and Ian were nip and tuck in the first game and at 14 all it was difficult to pick a winner – however Jim held his nerve and took the first game 18/16. The second game was similar to the first and again Jim playing his clever boasts and drops won the game 15/12 to take a 2/0 lead. Ian fought back in the third and playing a better length comfortably won the third game 15/9. In the fourth game Ian continued his good form and led 11/7 and the match looked as though it was heading for five games. 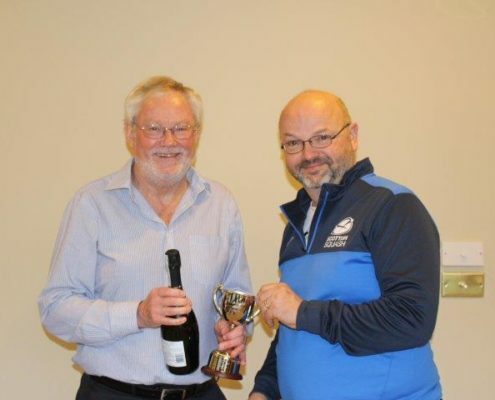 However Jim had other ideas and he fought back to lead 14/12 and have match ball – however despite Ian levelling the game at 14/14 Jim again held his nerve to win the fourth game 18/16, the match 3/1 and the O65 title. 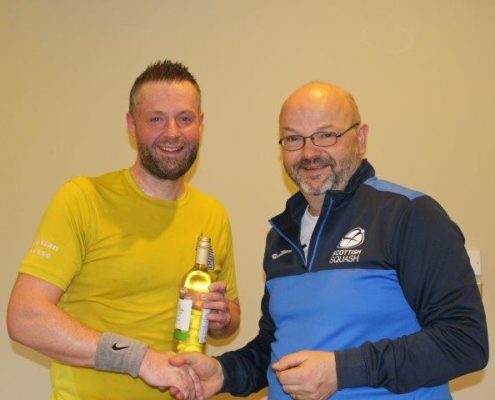 In the Plate Jim Webster had wins over Matthew Crawford 3/0 and Phil Leek 3/2 and Paul McDonald had wins over Duncan Selkirk and Colin Davidson. In the final Paul was too strong for Jim and Paul won 3/0. Paul, with his wife, enjoyed his weekend in Edinburgh and caught up with family and former work colleagues. 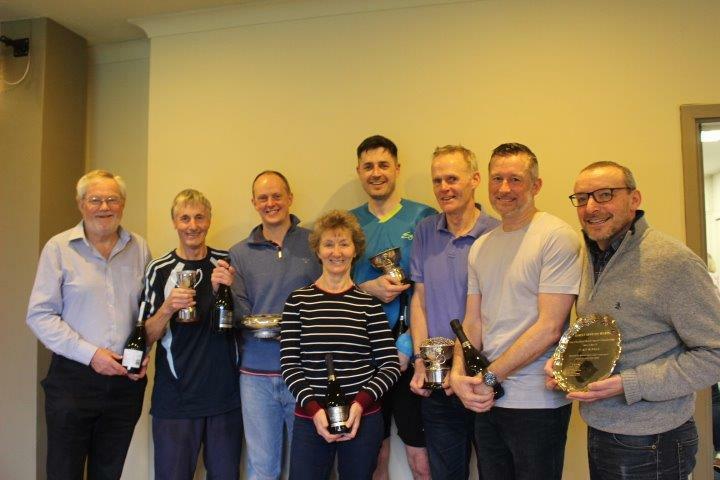 Initially there were 13 in the draw, but unfortunately the 1st seed, George Stirrat had to pull out due to a knee injury (initiated by his moving a dishwasher at home, rather than playing squash!). This resulted in Alex Sinclair and Warren Cameron taking over the 1 and 2 seeding positions, respectively. Alex Sinclair (1), Warren Cameron (2), Tom Kane (3), and Bernard Starkey (4) had byes in first round. A match of contrasts, Andy short, mobile and energetic. Against Alfie tall, leisurely with a soft touch. Result 15/8, 13/15, 13/15, 15/5, 15-13. A see saw of games which went to the last game with Andy taking the spoils. Vinnie, back on his travels from Canada, his absence was noticed and it was nice to see him again. He met up with an in-form opponent Alistair, who had to stay focused, cruising to 15/11, 15/8, 15/13 match. This was a closely fought match, which turned in David’s favour in the third game, with the score at 1-1 David took a long drawn out game, with Ken regretting not taking the opportunity of several game points in the 19/21. David then took the fourth 15/9 to take the match. John raced into an early lead 15-7 and was up 11-6 in the second game, when George pulled up and retired hurt. Andy working really hard and retrieving well, but having no answer to Alex’s more measured game and went down 15-5, 15-4, 15-9. A first meeting for these two with Alistair taking a nervy lead 15/12 in the first. Bernard came back with good movement and some control to take the second 15/9. Bernard kept his improved play into the third in what was proving to be a challenging match for both players. Bernard varied his play and moved the ball away from Alistair and wrong footed him – taking the third 15/9. The bottom half of the draw produced two excellent matches. The previous two meetings resulted in 3-0 wins for Tom, but this match proved to be different. David had come off a very unexpected 3-1 win against Ken Reid and was ready for battle. The first game went to form, with Tom going 1 game up. However, Dave caught on to Tom’s style of play, and with some skill and hard graft took the next two games 15/9, 15/6. Tom finally woke up, changed his game from the normal touch shot, playing lots of good length and burying any short balls. Tom took the final two games fairly comfortably 15/11, 15/11. Two highlanders who knew each other’s game contested a close match. Warren losing a nervy first, then settling to take the next two games 15/7, 17/15. A very closely fought match, Alex in control in the first game 15/7, taking it with better play. In the second and third games the match came to life and both players upped their play. In the second coming from behind, Bernard took control and had a number of opportunities to take the game but failed as Alex stood firm to win 17/15. In the third again it went to 14/14 but Alex showed his experience to shut Bernard out 16/14. John, having come off an unexpected win over number 2 seed Warren Cameron in the previous round, could not come to grips with Tom’s style, and the match was over quickly for Tom 15/9, 15-4, 15/3. Two contrasting styles – Alex with steady text book squash, very few mistakes and dogged play. Tom – lots of varied strokes, clever short game with lots of risk taking, game is either good or poor, depending on which Tom turns up, no in-between. Game 1: Tom off to a quick 6/2 lead with Alex struggling to cope with clever wrist action. Alex eventually settles in to his steady game and makes up the difference. A very competitive game, swaying one way then the other, but Alex takes this one 15/11. Game 2: Again Tom off to a quick start and again Alex catches up. The low roof on court requires both players to curtail their style, Alex normally relies heavily on his high lob service, Tom normally wins point with high lobs from front of court, but the low roof prevents both players from using this stroke. At 7 all, the pace of the game catches up with Alex and Tom takes this one 15/9. Game 3: Both players determined to win, go at it hammer and tongs with some skillful racquet play. Nip and tuck all the way, but Alex clinches it 15/13. Game 4: Again, long rallies and some punishing play from both players, this could go either way. Alex now breathing very heavily and appearing quite exhausted at 10/10, but rallies to lead 13-12 , but Tom steps up the pace again to take hand in at 13/13. Inexplicably Tom attempts a high service, the ball strikes the roof, score 14/13 to Alex. Final rally is frantic, Alex plays good length to the back of court and Tom attempting a cross court drop shot, puts the ball into the tin. Game over, Alex wins 15/13 and the match. 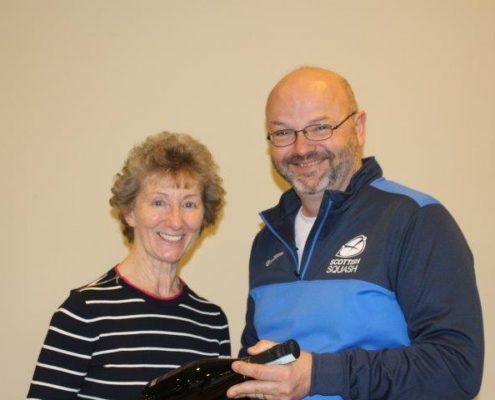 Result Alex won 3/1 to become the East of Scotland Over 70s winner. Ken Reid won the plate with wins over Alfie Thomson (3/2) and Vinnie Taylor (3/1). It is likely that the always popular Bridge of Allan competition will attract a good entry of Over 70s, with hopefully the return of George Stirrat after his injury, and an almost full 16 draw seems a possibility.